Last Wednesday I was driving to work on a quiet road when I saw a turkey starting to cross. I know this sounds like the start of a “why did the turkey cross the road” joke but, trust me, it isn’t. I slowed down, even though I assumed that the turkey would notice my car and do something sensible like stop or slow down. 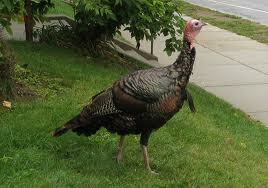 But this was a turkey – a bird not known for its high intelligence. It did notice my car. I know because it immediately sped up, bringing it in front of my car more quickly. I braked immediately and avoided hitting the foolish fowl, but it was a near thing. Turkeys are large birds so I suspect a collision would have done some real damage to my car, in addition to making a mess. Turkeys on the road are not unusual in New England, where I live. This one was different mainly because it was alone. They usually move around in gangs (my term, based on their behavior). I have seen a group of turkeys stop traffic on the local roads for several minutes as they trotted back and forth, deciding which side of the street they preferred to explore. They are more common in the spring and summer but, as this incident shows, they are still around and must be avoided. Apparently there are now approximately 7 million turkeys in the United States now and they are becoming a problem in many areas, congregating on people’s lawns and sometimes causing traffic accidents, either causing the driver to collide with them or to be hit from behind when other drivers fail to stop. Attempts by officials in some areas where they reside to round them up and kill them to reduce the problem have resulted in outcries from those who like and support them. Personally, seeing them always makes me smile. The bottom line is: turkeys are likely to remain a periodic road hazard so you need to watch for them when you drive anywhere they live. With that in mind, drive safely and let your only “close encounter” with a turkey be with the one on your Thanksgiving table.